Identify the programs list instructions. Describe Special Character Code Definitions. Understand the G & M Codes. CNC programs list instructions to be performed in the order they are written. They read like a book, left to right and top-down. Each sentence in a CNC program is written on a separate line, called a Block. Blocks are arranged in a specific sequence that promotes safety, predictability and readability, so it is important to adhere to a standard program structure. The steps listed above represent the simplest type of CNC program, where only one tool is used and one operation performed. Programs that use multiple tools repeat steps two through nine for each. Table 3 and Table 4 in section G & M Codes show the most common G and M codes that should be memorized if possible. Like any language, the G-code language has rules. For example, some codes are modal, meaning they do not have to be repeated if they do not change between blocks. Some codes have different meanings depending on how and where there are used. While these rules are covered in this chapter, do not concern yourself with learning every nuance of the language. It is the job of the job of the CAD/CAM software Post Processor to properly format and write the CNC program. The program in Table 1: below machines a square contour and drills a hole. Safety block to ensure machine is in safe mode. Spindle Speed 9200 RPM, On CW. Rapid to safe plane, use Tool Length Offset #1. Line move to cutting depth at 18 IPM. CDC Left, Lead in line, Dia. Offset #1, 36 IPM. Turn CDC off with lead-out move. Spindle Speed 3820 RPM, On CW. Rapid to safe plane, use Tool Length Offset 2. G98 G81 Z-0.325 R0.1 F12. Drill hole (canned) cycle, Depth Z-.325, F12. Return to machine Home position in Z. Return to machine Home position in XY. Reset to absolute positioning mode (for safety). The command block controls the machine tool through the use of letter address commands. Some are used more than once, and their meaning changes based on which G-code appears in the same block. Codes are either modal, which means they remain in effect until cancelled or changed, or non-modal, which means they are effective only in the current block. As you can see, many of the letter addresses are chosen in a logical manner (T for tool, S for spindle, F for feed rate, etc.). The table below lists the most common Letter Address Commands codes. Rotation about the X, Y or Z-axis respectively.The angle is in degrees and up to three decimal places precision. Used to compensate for tool diameter wear and deflection.D is accompanied by an integer that isthe same as the tool number (T5 uses D5,etc). No decimal point is used. Itis always usedin conjunction with G41 or G42 and a XY move (never an arc). When called, the control reads the register and offsets the tool path left (G41) or right (G42) by the value in the register. Sets the feed rate when machining lines, arcs or drill cycles.Feed rate can be in Inches per Minute (G94 mode) or Inverse Time (G93 mode). Feed rates can be up to three decimal placesaccuracy (for tap cycles) and require a decimal point. G commands often tell the control what kind of motion is wanted (e.g., rapid positioning, linear feed, circular feed, fixed cycle) or what offset value to use. This code calls a tool length offset (TLO) register on the control. The control combines the TLO and Fixture Offset Z values to know where the tool is in relation to the part datum.It is always accompanied by an integer (H1, H2,etc), G43, and Z coordinate. Defines arc size inX axisfor G02 or G03 arc commands. For arc moves (G2/G3), this is the incremental X-distance from the arc start point to the arc center. Certain drill cycles also use I as an optional parameter. Defines arc size inY axisfor G02 or G03 arc commands. For arc moves (G2/G3), this is the incremental Y-distance from the arc start point to the arc center. Certain drill cycles also use J as an optional parameter. Defines arc size inZ axisfor G02 or G03 arc commands. For anarcmove (G2/G3) this is the incremental Z-distance from the arc start point to the arc center. 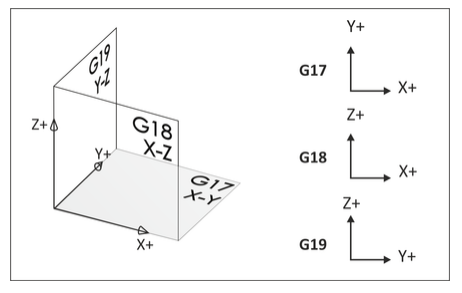 In the G17 plane, this is the incremental Z-distance for helical moves. Certain drill cycles also use J as an optional parameter. Fixed cycle loop count: Defines number of repetitions (“loops”) of a fixed cycle at each position.Assumed to be 1 unless programmed with another integer.Sometimes the K addressis usedinstead of L. With incremental positioning (G91), a series of equally spaced holes can be programmed as a loop rather than as individual positions.G10 use:Specificationof what register to edit (work offsets, tool radius offsets, tool length offsets, etc.). Always accompanied by an integer that determines its meaning.Only one M-codeis allowedin each block of code. Expanded definitions of M-codes appear later in this chapter. Block numbers can make the CNC program easier to read. They are seldom required for CAD/CAM generated programs with no subprograms. Because they take up controlmemorymost 3D programs do not use block numbers. Block numbers are integers up to five characters long with no decimal point. They cannot appear before the tape start/end character (%) and usually do not appear before a comment only block. Programs are stored on the control by their program number. 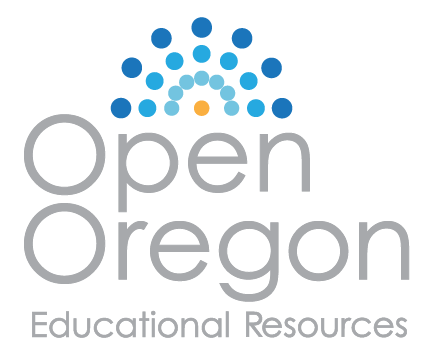 Thisis an integer thatis preceded by the letter O and has no decimal places. Dwell (delay) in seconds.Accompanied by G4 unless used within certain drill cycles. The incremental feed distance per pass in a peck drill cycle. G83 X2.000 Y2.000 Z-.625 F20.R.2 Q.2 P9. Arcs can be defined using the arc radius R or I,J,Kvectors. IJK’s are more reliable than R’s so itis recommendedto use them instead. Ris also usedby drill cycles as the return plane Z value. G83 Z-.625 F20.R.2 Q.2 P9. Spindle speed in revolutions per minute (RPM). It is an integer value with no decimal, and always used in conjunction with M03 (Spindle on CW) or M04 (Spindle on CCW). Selects tool. It is an integer value always accompanied by M6 (tool change code). Also defines dwell time on some machines. In these controls, X and U obviate G90 and G91, respectively. On these lathes, G90 is instead a fixed cycle address for roughing. Until the 2000s, the V address was very rarely used, because most lathes that used U andWdidn’thave a Y-axis, so they didn’t use V. (Green et al 1996 did not even list V in their table of addresses.) That is still often the case, although the proliferation of live lathe tooling and turn-mill machining has made V address usage less rare than it used to be (Smid2008 shows an example). In these controls, Z and W obviate G90 and G91, respectively. On these lathes, G90 is instead a fixed cycle address for roughing. Absolute or incremental position ofX axis. Coordinate data for the X-axis. Up to four places after the decimalare allowedand trailing zeros are not used. Coordinates are modal, so there is no need to repeat them in subsequent blocks if they do not change. Coordinate data for the Y-axis. Coordinate data for the Z-axis. The following is a list of commonly used special characters, their meaning, use, and restrictions. All programs begin and end with % on a block by itself. This code is called tape rewind character (a holdover from the days when programs were loaded using paper tapes). Comments to the operator must be all caps and enclosed within brackets. The maximum length of a comment is 40 characters and all characters are capitalized. Codes after this character are ignored if the Block Delete switch on the control is on. This character is not visible when the CNC program is read in a text editor (carriage return), but does appear at the end of every block of code when the program is displayed on the machine control. G&M Codes make up the most of the contents of the CNC program. The definition of each class of code and specific meanings of the most important codes are covered next. Codes that begin with G are called preparatory words because they prepare the machine for a certain type of motion. Rapid motion.Used to position the machine for non-milling moves. Line motion at a specified feed rate. Return to machine home position. Cutter Diameter Compensation (CDC) off. Cutter Diameter Compensation (CDC) left. Cutter Diameter Compensation (CDC) right. Simple drill cycle with dwell. Drill cycle return to Initial point (R). Codes that begin with M are called miscellaneous words. They control machine auxiliary options like coolant and spindle direction. Only one M-code can appear in each block of code. Program stop.Press Cycle Start button to continue. End program and press Cycle Start to run it again. This code commands the machine to move as fast as it can to a specified point. It is always used with a coordinate position and is modal. Unlike G01, G00 does not coordinate the axes to move in a straight line. Rather, each axis moves at its maximum speed until it is satisfied. This results in motion as shown in Figure 18, below. Caution: The rapid speed of some machines can exceed 1. An incorrect offset or coordinate move can crash the machine faster than the operator can hit the emergency stop. Use the rapid feed override on the machine when running a program for the first time. G00 for Fast Positioning ; Rapids Motion as fast as your machine will go. Used to move the cutter through air to the next position it will be cutting. G01 for Slower Cutting Motion; Feed Motion slower, for cutting. Feedrate set by “F” G-Code. F-word = “F” as in “Feedrate”. S-word = “S” as in “Spindle Speed”, address is rpm. G00 X0 Y0 Z0 Or use G01 if you want to go slower G01 X0 Y0 Z0 F40. Interpolated motion or an interpolated move, When we specify multiple coordinates on a line, means more than one axis of the machine is moving at the same time. In fact, the controller will move them all at exactly the right speed relative to one another so that the cutter follows a straight line to the destination and moves at the feedrate. G00 and G01 are modal, so we only have to specify them when we want to change modes. The concept of interpolated moves raises an interesting issue for the Z axis. It’s often a good idea to move the depth-of-cut-axis on its own, rather than as coordinated motion with other axes(X and Y). Whether you’re going to have a problem (collision) as the cutter gets close to the workpiece and fixturing. First moving in X and Y and then moving in Z , it’s much easier to judge whether an accidental collision is about to take place. You’re also much less likely to hit some random object sticking up, like a clamp, if you keep the cutter high until you’re directly over where you want to start cutting. G02 establishes a mode for clockwise circular arcs. G03 establishes a mode for counter-clockwise circular arcs. The G02 or G03 mode is established, arcs are defined in G-Code by identifying their 2 endpoints and the center which must be equi-distant from each endpoint. The endpoints are easy. The current control point, or location when the block is begun establishes one endpoint. The other may be established by XYZ coordinates. 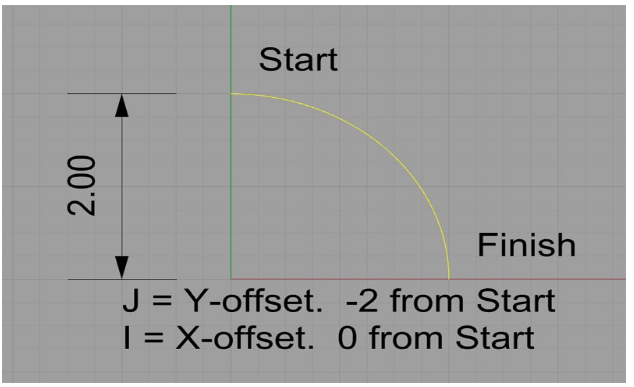 The center is most commonly identified by using I, J, or K to establish relative offsets from the starting point of the arc to the center. The Center Using Radius “R”. Arcs must exist on a plane designated by the command G17 (XY), G18 (XZ) or G19 (YZ). G17 is the machine default. CDC is a key to precision CNC machining, allowing the operator to compensate for tool wear and deflection by commanding the machine to veer left (G41) or right (G42) from the programmed path. G40 cancels cutter compensation. The amount of offset is entered in a CNC control D-register. The wear register can be thought of like a table that the control refers to with every move. The value in the D-register is calculated by the machine tool operator, who monitors the finished size of part features, compares them with the print, and enters the difference in the register as needed to keep the part within specifications. If there is no deviation, the register is set to zero. G01 G41 D1 X1.0 Y.25 F40. G43 activates tool length compensation. It is always accompanied by an H-code and Z-move, where H is the tool length offset (TLO) register to read, and Z is the height to go to in reference to the part datum. The TLO is combined with the active fixture offset on the control so the machine knows where the tip of the tool is in relation to the part datum. Tip: G54 is usually usedfor the first machining setup. Additional offsets are used to machine other sides of the part. The X and Y values represent the distance from the machine home to part datum XY. The Z value is the distance from the tool reference point (for example, the top of a 1-2-3 block) and the part Z-datum. 1. Please describe the CNC program list instruction. 2. All CNC program start and end with what? 3. Describe letter address Commands codes. 4. Please lists three special character codes. 5. Describe G and M codes. 6. Please describe G00 G90 G54 X0 Y0. 7. Please describe G00 G90 G43 H1 Z1. 8. What is the different between G00 and G01? 9. Explain the different between G02 and G03. 10. Please Describe the F and S word.